In this Anzac centenary year there have been books, movies and TV series, musical compositions, interviews, readings from diaries, exhibitions of artefacts and, perhaps most powerfully, of photographs, all recording or reflecting upon that war that was supposed to end all wars. There are even web-albums of photos of priests celebrating Mass in war zones, including at least two photos of Australian soldiers at Mass in the trenches of Gallipoli. Other snaps show servicemen at Masses offered in the ruins of villages or in open fields during the French campaigns. The unknown soldier in the beautiful memorial in our cathedral would not have felt out of place amidst our rites. There are of course such photos from many wars. The most historic dates from the American Civil War: a simple wooden cross fronts a tent serving as a sanctuary; outside the priest preaches to attentive soldiers as well as ladies with parasols. From Normandy, soon after D-Day, we see a snapshot of troops kneeling as the priest whispers the Canon, the bonnet of a jeep his altar. In another the priest celebrates Mass for soldiers in the shell of Cologne cathedral. A third has a marine piously receiving Holy Communion on the Japanese island of Iwo Jima. There are also shots of Masses in more recent theatres of combat, including a priest in Afghanistan in 2010 offering Mass on an altar of cardboard boxes. 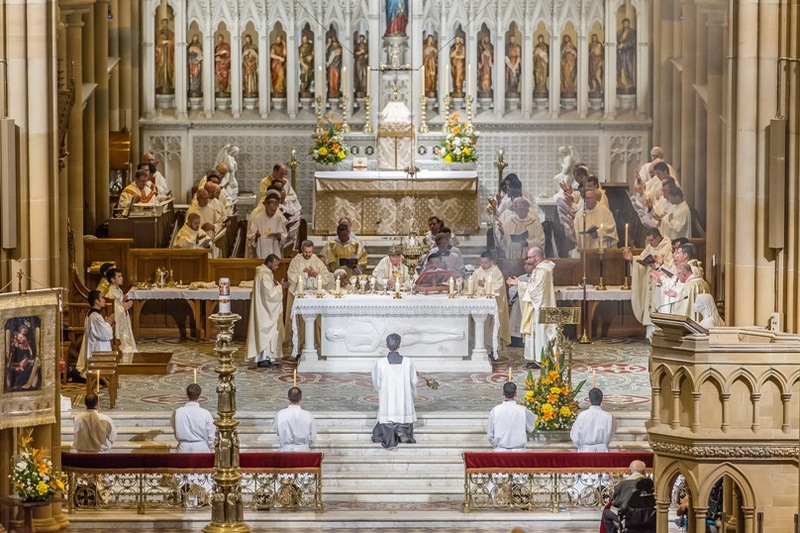 All these images speak powerfully of the role of a priest of Jesus Christ and so to our soon-to-be priests. Happily, our nation is not torn asunder by war or civil strife. Our cathedral is not a shell of its former glory; our altars not cardboard boxes; our people not praying in fear for the day ahead. We live in peace and offer Mass in thanksgiving – even as we know that many of our Christian brothers and sisters in other parts of the world are not so fortunate. Catholics, at least in urban Australia, have the comfort of the sacraments available almost anytime. 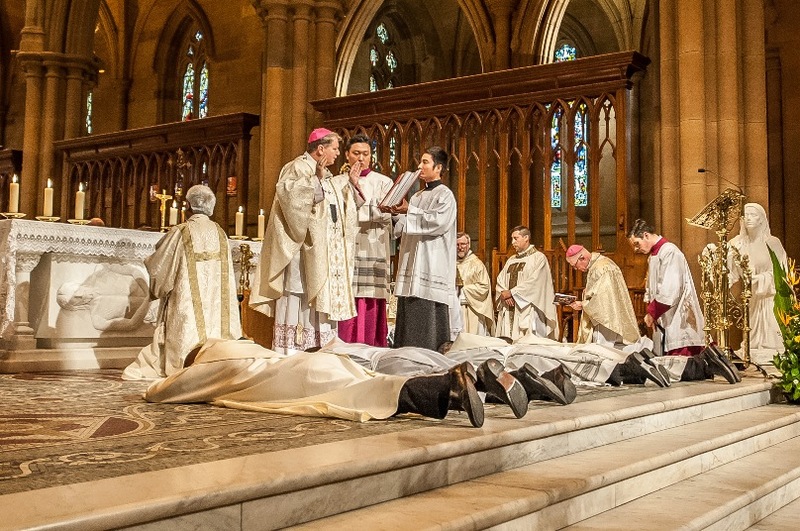 Most have daily Mass at several locations within a few minutes’ drive and generous priests ready to baptise, absolve, preach, educate, marry, pray, anoint, console and bury them – all in that peace-zone that is Sydney. Yet the priests of Sydney today are indeed called to serve in a ‘war-zone’. Our Christian tradition, from the earliest days, spoke of a mortal combat with the world, the flesh and the devil (Eph 2:1-3). Such dark talk might be unfashionable today, but the challenges of striving for holiness are there for Christians in every age: our own passions, weaknesses, temptations; being drawn every which way by our peers, technologies, culture; cultural and ideological forces surrounding us both for good and for ill.
We give thanks that we are safe to celebrate Mass in this city; but we know that even Sydneysiders are not immune to violence. This very cathedral has had two memorial services for victims of terror over the past year alone. Nor are we immune to the forces in our ambient culture hostile to our faith or more subtly corrosive of Christian souls. In some places the problem is fundamentalist theists who insist that their interpretation of their faith tradition is the only acceptable belief for any human being and who dream of imposing some sort of caliphate in which all religious difference and indifference is wiped out. Here in Australia, on the other hand, the problem is more often with fundamentalist atheists who dream of a secular caliphate in which all religious belief is eradicated from law, institutions, culture and the human heart. 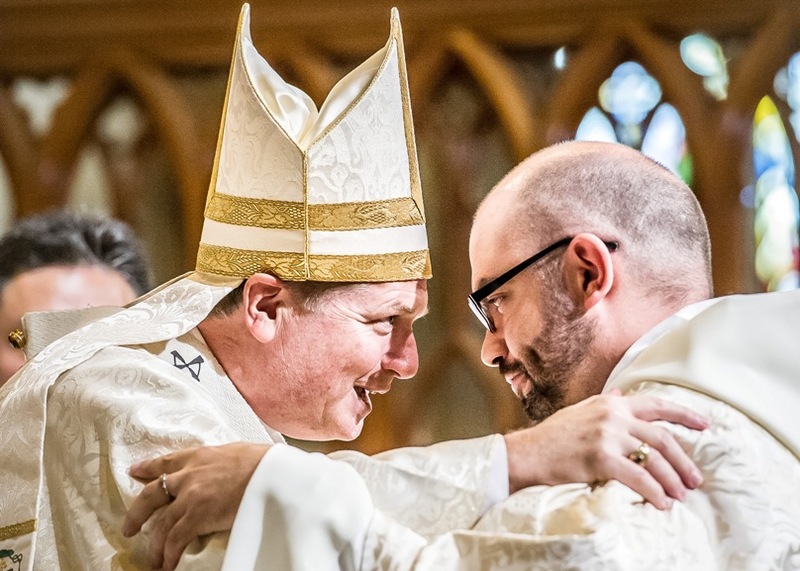 That one of our Sydney priests, now Archbishop of Hobart, has been taken to his state’s anti-discrimination tribunal for have the audacity to distribute a bishops’ pastoral on marriage shows just how far things have gone or might go if we are not alert and active. Yet even these contests are first and foremost internal ones, as we are tempted too enthusiastically either to flee or to fight, to put first our natural desire to be right and not care about who is excluded or hurt in the process, or to put our equally natural desire to be loved first and call inactivity in defence of the faith inclusiveness. To contend with all this, our Scriptures and tradition advise us to pray always, receive the sacraments, cultivate virtue, persevere in good works and ask the angels and saints for their intercession. St Paul suggests we kit up with Godly armour: ‘girding our loins’ with the camo pants of Truth, our chests with the khaki of Righteousness, our feet with the boots of Peace, our heads with the helmet of Salvation, with Faith as our flack-jacket and the Spirit as our gun (Eph 6:12-18). Like Paul, Pope Francis is not shy to use sporting and military metaphors for the spiritual life. He regularly talks of our contest with the devil and with evil. One of his favourite ways of describing the Church is as “a field hospital after battle”. Today, according to the Holy Father, the Church needs to be near people with open wounds or deep scars from one kind of combat or another, ready to soothe and heal them with the tender mercy of God. So he challenges us to identify those on the ‘existential peripheries’, those in the spiritual and emotional war-zones in our own parishes and city. In just a few weeks the Church will mark the Golden Jubilee of Presbyterorum Ordinis, the Second Vatican Council’s Decree on the Ministry and Life of Priests. That document makes clear the indispensable role of priests in the Church. Priests mediate the mercy of God to His People; offer sacrifice and absolve sins in Christ’s name; preach the prophetic word like Jeremiah in our first reading (Jer 1:4-9); guard and shepherd their flock like Peter in our epistle (1 Pt 5:1-4); tend not only the full-grown sheep but also the lambs, as Christ commands in our Gospel (Jn 21:15-17). For such a beautiful mission, for such life-and-death work, the Church needs you: Gustavo, Daney, Mate and Josh. Our ordinands today hail from four continents, from the Americas, Asia, Europe and Australia; they are truly an international peace-keeping force. Our Ecuadorian, Gustavo, comes from a small family by the standards of the Neocatechumenal Way: he is ninth of only 15 children. An electronics technician, he discerned his vocation to the priesthood in the Way and through his formation has come to know the Christ who “defends, protects, seduces and provides” for him. Aware of his own poverty of spirit, he wants to proclaim God’s unconditional love to a world crying out for love. Daney grew up Christian alongside Hindus and Muslims in the slums of India. He had work as an electrician and many friends, but admits he was lonely and unfulfilled, not really knowing what being a Christian meant. Then he encountered the Way and heard that all Christians must bear witness to the Gospel. He learned to look not at himself but at God’s action in the world. If he was to do that he had to conquer his resentments, receive God’s mercy, and discern his personal vocation. In his priesthood he will help others who are lost to discover that Way, Truth and Life who is Christ. Our Croatian, Mate, was what we call ‘a late vocation’. His restless soul could find no peace in studies, relationships or career. Then, at a youth gathering of the Neocatechumenal Way, he discovered life’s meaning is found in the Crucified One. At the Redemptoris Mater Seminary here in Sydney he has learnt to trust entirely in God. He will communicate that trust now to those on the existential peripheries in Sydney. Joshua comes originally from Sydney. After his family and university chaplaincy he was blessed to find the Emmanuel community who encouraged him to become himself by giving himself away to others. World Youth Day revealed to him the profound happiness that can come from a seriously Catholic life. At the Good Shepherd Seminary he learnt that all true priests are mission-men not mere maintenance-men. He will carry out that mission in Sydney, opening up the field hospital of the Church to the battle weary, and offering them the freedom, peace and abiding joy of communion with God and his saints. Like those priests immortalised in the photos of Masses amidst war, Josh, Mate, Daney and Gustavo will be right there, in the thick of the action of life, accompanying, teaching, feeding and forgiving God’s people in their struggles, being soldiers for the faith and doctors in the field hospital of the Church. For this task in this Anzac centenary year, I now commission four new officers for Christ. Thanks be to God for our very happy celebration today! I echo Josh’s words of gratitude on behalf of the four new priests to all those who brought them to this day and helped us celebrate it. I congratulate their families and the brothers and sisters of the Emmanuel Community and of the Neocatechumenal Way. With my brother bishop and priests of the Archdiocese of Sydney I welcome them with all my heart into the Presbyterate of Sydney. Six in one year is much “better than a poke in the eye”, and we are grateful to God and to these generous men that they have offered themselves for the Priesthood of Jesus Christ. But we need more such heroes and I ask you all to pray for and promote vocations in your families, communities and parishes. Finally, on behalf of you all, I congratulate Fr Joshua Miechels, Fr Mate Litric, Fr Daney Irudaya Doss and Fr Gustavo Criollo. Thanks be to God! 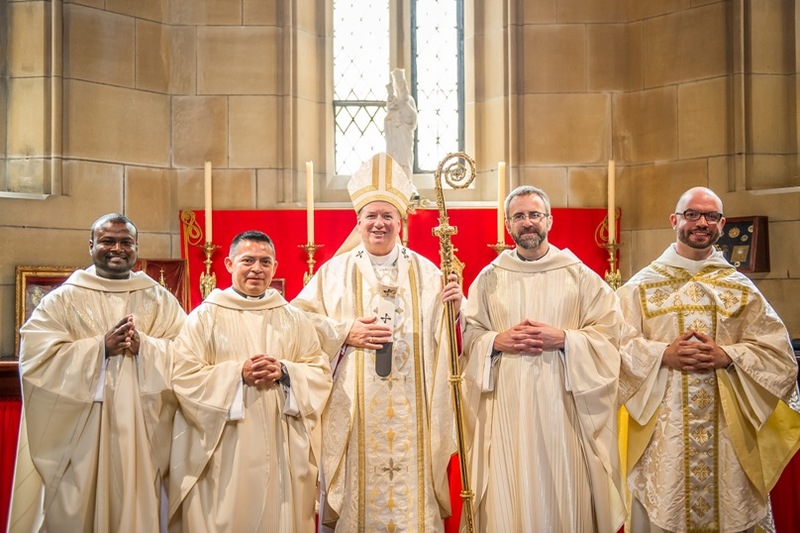 This is the edited text of the homily given by Archbishop Anthony Fisher OP at the Mass of ordination to the priesthood of Gustavo Criollo Farfan, Daney Irudaya Doss, Mate Litric and Joshua Miechels at St Mary’s Cathedral on 31 October.